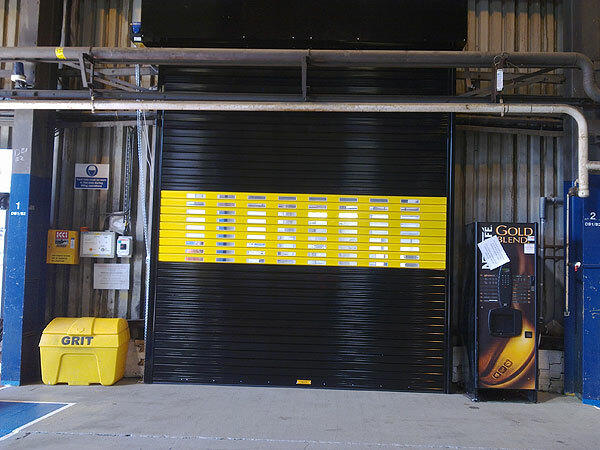 Worcester Doors successfully completed the design manufacture and installation of a very bespoke and individual roller shutter door for a train depot within the West Midlands. The client wanted a secure barrier between two train maintenance sheds one of which is utilised for carriage painting and preparation of same and the other is for general maintenance and repairs. Therefore suitable insulation for heat retention and dust control was critical. There was also a need for the door to operate faster than a normal roller shutter to reduce down time in production. The final request was for the solution to incorporate some form of visual access to allow the workforce to check on progress during working hours and to also allow security patrols to check inside the building outside of normal working hours without entering the controlled environment. We manufactured the door with a higher than normal gear ratio and a high rpm motor and thus reduced the opening time from standard design by nearly 50%. We installed a row of windows within the curtain to allow the required vision, both sides of the door had keyswitch actuation installed so only authorised members of staff could access the area as and when required. We also highlighted a section of the black curtain in yellow as the working area is within a confined space and we felt additional visual indication of the doors position was crucial. The company has been very impressed with the reduction in contamination within its finished painted carriages and its reduction in heating costs for this one shed and have stated that they recovered the capital expenditure cost of the door in less than a year.